Get Chewie w/o Dengar here! I, like most of you here I'm sure, struggled with this event for hours on end! My line-up is as follows: G12 Bossk, G12 Cad Bane, G12 Greedo, G11 Boba, and G11 IG-88. It's pretty well-known at this point that Dengar makes it waaay easier. Anyways, to the point- I couldn't be bothered to grind up Dengar and wait for the next event, so I toiled away trying different strategies until I got it. 1: Cad Bane got stunned, no ability block on anyone else. R-2 stealthed everyone except himself. 2: Greedo stuns R2, then Bossk bursts him down with the net. 3: Once R2 was down, I didn't have to worry about who to target. Boba uses Execute on chewie and he goes next. 4: I had to try and keep Lando either ability blocked or stunned while I killed ROLO to do away with all her stupid TM and ability block business. 5: Once ROLO was done for I could deal with Lando, and then finally Han. -Boba's BH Resolve was what won it for me. Luck had it that they managed to get him low and then only kill him right after I had gotten another kill, allowing him to come back. -While most strategies suggest bursting down chewie first and only succeeding if R2 didn't stealth right away, I simply couldn't get lucky enough between greedo's hits not proc'ing and either Bossk or Cad being stunned/ ability blocked. -I used Bossk's frenzy to get as many attacks off as possible on the Contract target, which let me complete my contract shortly after Chewie died while attacking ROLO. The extra speed from the contract payout saved me from getting burst down by Lando's special and Han's ridiculous attacks. -Boba has to use his ability block after chewie dies. This keeps Han from stunning our squad and bursting them down with Lando. I wasn't able to do it until everyone actually survived the initial 2 turns. IG-88 did die after he took his 3rd turn, and Bossk after that, but once R2 and Chewie died, Bossk and IG-88's last couple hits on ROLO were ABSOLUTELY necessary to finish the contract and kill ROLO. Thanks for sharing. Running the same team-will try your strategy now. Was it a Bossk lead that you used? Finally did it after gearing Boba up to G11. zBossk (L) G12, Boba G11, Cat G11, Zam G11, IG88 G10 worked after 3rd try. Before, with Boba at just G10 i could get one kill best. I don't had very high speed, Boba was best with 192, mainly modded them for protection and defense, especially Bossk and Cad. Also got Chewie first, than killed Lando and Han. But after Chewie was gone, and the contracts triggered it was really easy. No casualties on my team, surprisingly. I think the key was that R2 doesn't used his stealth for the first two actions, and i could land ability block from Boba on him. Taunt with Bossk, and then everyone fired on Chewie. I did it too with no dengar using Embo G12 lead (Zeta unique) bossk g12, greedo g12, bobag12, Bane 10+5. It was very RNG dependant. And it took probably 300 to 400 tries till all planets aligned and was able to kill Lando and activate the contract only with the counter attack with no turn been taken. Yes. Bossk lead was essential for me. I did it with Zboosk G12 health and defense mod, boba G12 CD and CC mod, ig88 G11 CD and CC mod, cad and greedo G10 protency mod. I only used one zeta on boosk and did it after 1x trials i think. Most player without dengar quit and restart when R2 smoke screen, but that is wrong from my observation and on my winning trial, R2 did open the smoke screen on first move. The key is either focus on R2, if it open smoke screen, chewie if R2 did not open smoke screen. Always ability block or stun R2 if you target Chewie. Also, boba execute can be used as damage instead of finish for the first character you are bringing down, it is not necessary to wait for the finishing bow. However, once you finish either R2 or chewie, try to let boba finish the enemy. As MamasMeat mention, resolve from boba is the key of winning. My boba alone face Han, leia and lando. And I manage to kill all of them with bounty hunter resolve. The only RNG I will restart the trial is han stun greedo or cad bane by shot first. They are squish but will provide a lot of stun to the team and debuff which heal the team. It is ok to stun ig88, it is useless anyway. I agree. I think people are falling prey to RNG deaths leading them to think + survival is the only way to strategy here. 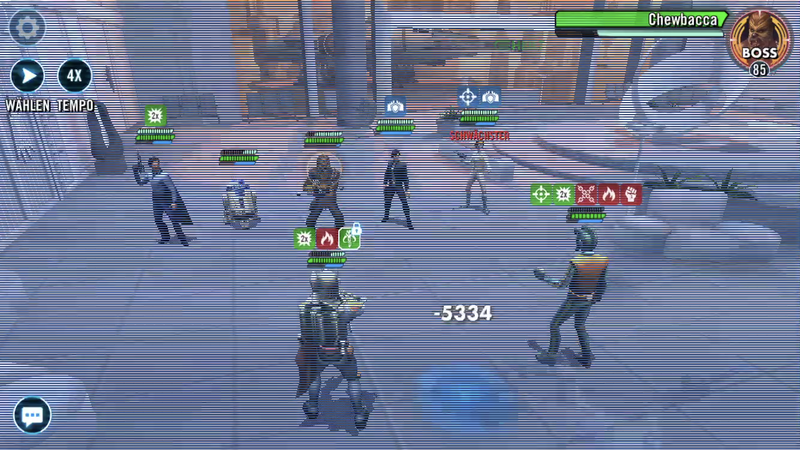 If you want to use a Bossk 88 Greedo boba Cad team then you need their kits' abilities. You will need lots of +speed and +health +prot too. I am actually thinking the only defense aspect to mods for this would be crit avoidance arrows.